We spent 18 hours researching and testing 15 different types of cat collars and found that durability, style, and safety features were most important. The Rogz Catz Breakaway Cat Collar scored head and shoulders above the other collars we researched in all categories and is our top pick. The breakaway feature is perfect for keeping cats safe as they climb and jump. This breakaway feature can be set to three different weight limits. We liked the glow in the dark feature as well which made it easy to spot our cats at night. The scratch proof webbing keeps the collar looking great. A cat collar is a regular item owner’s purchase for their furry pets. It is two –fold in use and acts as a way of showing ownership as well as being a form of decoration for their pets. It can also be a way of expressing your personality. If your cat goes outside, having a collar is a safety issue as well and lets people know that the cat is owned. It is a good thing to have in case the cat becomes lost so you need to make sure the cat’s tag is on the collar. Choosing the right cat collar is very important for many reasons, one of the most important being safety. Many cat owners may not realize that a cat’s collar can be a safety hazard by getting snagged on fences, branches, furniture, and other things. The wrong collar can cause the cat to become strangled should it get caught on something while the cat is jumping from place to place like they love to do. There are several things that you want to look for when choosing the right cat collar. This guide and the reviews that we provide below will help you sort through the different choices so you can make the best decision for your cat. There is a definite difference between a cat collar and a dog collar. Following the information in this guide will steer you in the right direction so you choose the right collar for your cat. If you’re looking for a great cat collar that has plenty of safety features, the Rogz Catz breakaway cat collar is right up your alley. The collar is adjustable and fits neck sizes 8” to 12”. They have a new Safeloc Breakaway Clip that has an adjustable breakaway load on the buckle. This breakaway clip can be set for a breakaway load of 6.6 pounds or more, 8.8 pounds or more and 11 pounds. If the collar is placed under an extreme amount of strain, it will break free which protects your cat from strangulation if the collar gets hung on something. This collar is 1/8” wide and has reflective and glow-in-the-dark features that allow it to be seen by vehicles and people at night as well. The glow in the dark feature is made from polyurethane; the same reflective material on the inside and outside that is found in athletic shoes. The overlay printing that is on the outside of the collar also glows, which makes it fun to watch as the cat moves about in the dark. The edges of the collar have been stitched after being rolled to make sure that any sharp edges or open ends are not a problem. The webbing is scratch proof as well, making it a durable, long lasting collar. There is also a colored and removable bell. It is the perfect collar that fits most breeds and sizes of cat. 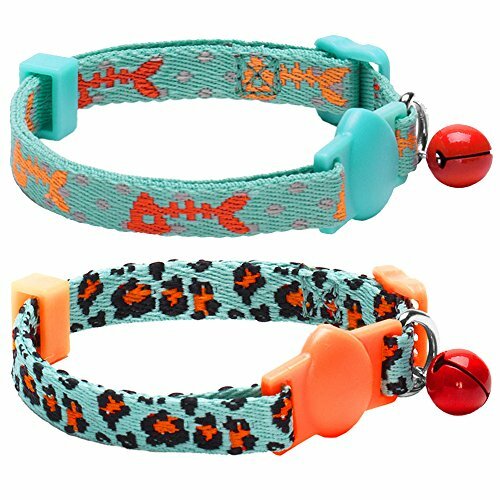 This 2 pack of breakaway cat collars is perfect if you have two cats to buy for, or if you want to have a second collar to switch out with. The design of these two great collars will help your cat step out in style. Both collars have a teal background. One has an expanded ocean scene with fish in orange and pink. The second collar has a safari look with leopard prints. These collars are made from polyester and are extremely durable. Each collar measures 3/8” wide and fits cat neck sizes from 9” to 13”. The collars are easy to take care of and are breakaway collars that will break free should your cat get the collar caught on a branch, fence, or some other protruding object. 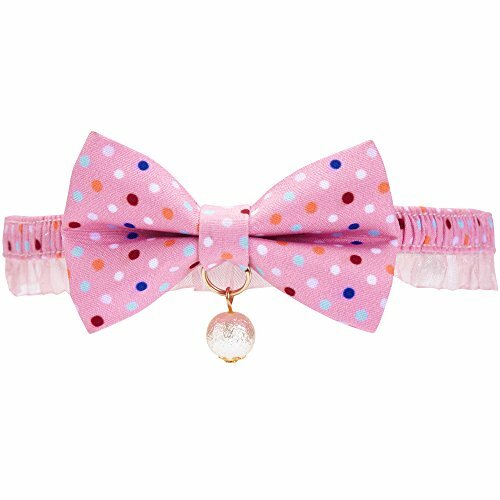 Your cat will look very stylish with this business cat bow tie breakaway collar. The collar is solid black and is a breakaway style to prevent your cat from being choked should it get caught on something. The bow tie has an elastic loop on the back of each one that makes it easy to affix to the collar. The bows are handmade in the USA. The great thing about this set is that the bow ties will work on most regular cat collars. The elastic band can be looped around most collars so you can update the look of any collar your cat may already have. This is an adorable way to add some style and class to your cat’s look. Choosing the right cat collar is important for many reasons, the most crucial being the safety of your cat. Everyone likes their cat to look stylish but the wrong collar can cause a lot of problems even if the cat doesn’t go outside. The three collars we have reviewed above are all excellent choices for their safety features alone but they are also stylish and attractive collars that your cat will look fantastic sporting. All are made from durable and long lasting materials that will stand up to the antics and activities of your cat. To learn more about choosing the right collar for your cat, read the buyer’s guide below. It has got information on what to look for when you are searching for that perfect collar. This information will make the search much easier to sort through the different choices available. We have listed the factors that you want to look at when you are searching for your cat’s collar. These factors will ensure that the collar you choose is not only stylish but safe too. Breakaway – There are two types of collars that you can get for your cat that have this breakaway feature. One is an elastic stripping that is located behind the buckle. This elastic will stretch if the cat gets it caught and will allow the cat to slip free of the collar. The second mechanism is the breakaway buckle or catch. This type has a buckle or release that is usually rated for a certain breakaway load that will vary from 5 or 6 pounds to 11 pounds or so. On the release type of collar, the release or buckle will come apart if it is caught on something. The result is the same, the cat will able to get out of danger if he gets hung on something by the collar. Collar Width – Cat collars are usually narrower that dog collars to accommodate the smaller neck sizes that they have. Don’t choose wide collars for a cat because they will not sit comfortably around their neck and could prevent them from moving naturally when they are walking and climbing. Collar Weight – Even larger cats don’t have the bone structure or weight that a dog has. This means that a heavy, bulky collar will cause them trouble. If the collar is super heavy the cat will be off balance and it could cause them to miscalculate jumps and climbing. Collars with charms or bling of some kind that is stiff can cause them to scratch or damage their skin, especially the way they clean themselves so much. These considerations above do not make it impossible to find a collar. A lot of cat collar manufacturers make sure that these factors are included in the creation of the collar. Making sure the collar has these points will provide you with a collar your cat will be happy to wear. Must be a breakaway collar – This is probably the single most important feature of the collar you buy. Making sure that the collar is breakaway will give you the reassurance you need that your cat is safe while it is out and about, or even in the house. Cat Bells – This may seem like nothing but a decorative feature but the little cat bells that are on most cat collars actually have a purpose. Cats are notorious bird chasers and they can move very stealthily. The bell prevents the cat from being able to sneak up on birds and kill them. It can also help cat owners keep track of their cats. ID tags- If your cat is an outdoor cat, having an ID tag is a good way to ensure that your cat would be returned home in the event they become lost. ID tags can be purchased from pet stores or vet’s offices or even online. Adjustable – If you purchase a collar for your cat when it is a kitten you will need to check every single week or more to make sure that they haven’t grown too much and caused their collar to start cutting into their necks. You also want to make sure that if your cat is an adult that the collar is fitting properly and is secured. Ideally you want to be able to slide two fingers between the collar and your cat’s neck. Make sure that the collar doesn’t become stretched out or too loose. Avoid cheap collars that have lots of loose threads, sharp edges, buckles that can come apart or break and other bad quality traits. You want to purchase a good quality, well made cat collar so it lasts a long time and so it is the safest it can be. Flea collars are not a good choice for cats due to the allergic reactions and skin sensitivities they can cause. They also tend to be left on the cat long after the term of their use is up. Avoid tons of bling, charms, large bells and other things that will hang from the collar excessively. These can irritate the cat and also cause problems by getting caught. Cat collars are not just for decoration. They offer the same benefits that dog collars offer to dogs. There are a lot of different cat collars on the market made from different materials ranging from leather to nylon. When choosing the right cat collar, it’s important to remember to look for the kind of collar that looks great on your cat but that also provides the safety that is important for your cat to have. The best material to look for is polyester. It is easy to adjust, is breathable and is easy best suited to the safety features that cat owners look. Polyester is also a lot more durable and will last longer than other materials. It can be solid colors or have patterns printed on it as well so you are not stuck with one or two choices and that’s it. 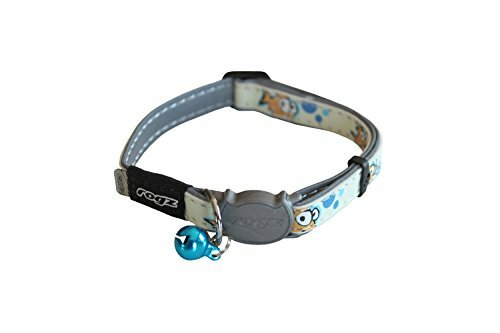 Once you have found the cat collar you want to use for your cat, there will be a period of adjustment for the cat if they have not worn a collar before. Make sure the collar doesn’t have a lot of charms hanging from it and that it is lightweight. Use catnip if necessary to keep the cat distracted while they are getting used to the cat collar. If you have followed the tips and suggestions in this guide, the cat collar you have chosen will not be heavy or bothersome to the cat at all and hopefully will be lightweight enough that the cat doesn’t pay any attention to it. Just make sure that the fit is accurate and that the safety features are in place and your cat will have a brand new collar to show off. Jennifer manages our Pets and Services categories. Jennifer was a dog trainer for 4 years before joining the ThoroughlyReviewed team. She still does it part-time. When she's not working she loves going to the park with her two Weimaraner's Lily and Bells. © 2019 ThoroughlyReviewed All rights reserved. ThoroughlyReviewed.com is a participant in the Amazon Services LLC Associates Program, an affiliate advertising program designed to provide a means for sites to earn advertising fees by advertising and linking to amazon.com, amazon.co.uk, amazon.ca.